Notice:This product does not include any Apple Watch or watch band. ✔Electroplated coating makes its surface shinny. It can definitely make your watch look much more elegant and luxury. ✔Made from high quality material, it is soft and flexible. Will not scratch your watch. Instead, protect your watch from being scratched. ✔This soft TPU case is ultra-slim and lightweight, accurate positioning of the product hole, 360 full protection of the watch surface.No need to remove the shell for charging. ✔Negligible 0.3mm thickness, case fits around the watch without adding any extra bulk, yet sturdy enough to withstand great pressure. Perfect adhesion, snug in place, without any worry about it suddenly escapes from the watch. ✔You can get 5 Colors ,Crystal Clear ,Gold, Rose，Sliver, Black . 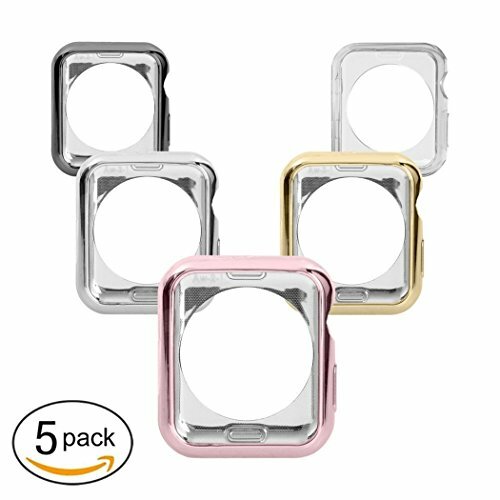 5 Color combination pack dresses your Apple Watch to match your daily mood.And one tempered glass screen protector for free as a extra gift send to you!